This is a sponsored review. As always all opinions are honest and those of mine and JustaBXgirl. There’s a new Dr. Panda game waiting to be played. If you didn’t know, now you know Dr. Panda is one of our favorite app developers. Yup, I have no idea what I will do when JustaBXgirl starts thinking that she’s too grown for the games. Even though, I’m not thinking that will happen anytime soon though since I catch her nine-year-old cousin and sometimes even the thirteen-year-old enjoying time on different Dr. Panda apps. It seems after Restaurant 3 that the hard working Dr. Panda needs a break. And a break he will have in this new app that is being released today (May 24, 2018) on the App Store, Google Play, and Amazon App Store! It is a free download but there are in-app purchases. Now that you know how to get the game let’s get down to business. In case you were wondering, that business would be vacation. 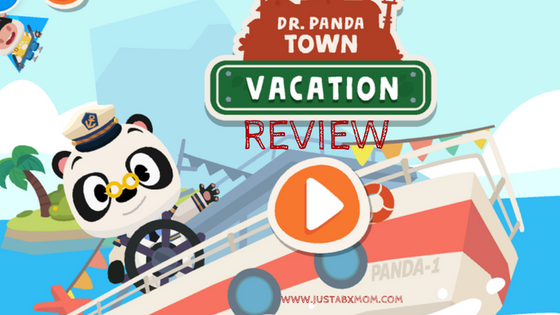 While on vacation, Dr. Panda and friends cruise around on a yacht fully equipped with an onboard spa, smoothie bar, and pool to name a few. Once Dr. Panda and his pals get tired of lounging around the ship they can head out for some island hopping. There are three islands to visit, an arctic island, a beach island and forest filled island with chirping birds and tents to camp in. I probably say this about every Dr. Panda app when it is released but I think this is my favorite. There is just so much to do on each island and the ship. Oh, and if you head into the map you can access other apps in the Dr. Panda universe. I want to choose a favorite island and tell you what not to miss but I think you need to visit them all. You MUST go parasailing on the beach island, build a snowman in the Arctic and go fishing in the forest. JustaBXgirl had the same difficulty as me when trying to choose a favorite island. She loved snowboarding on the arctic island, ziplining through the forest and scuba diving off the beach. Can you tell which of us is the adventurous one? There really is something new to discover every time you play. And there are so many characters to use. It is a great way to help your children storytell. JustaBXgirl loves to create stories for the different characters. She creates families and tells me about them and what they like to do then she walks me through their time on the ship and on the islands. She told me to go away and leave her alone so she could play. We both love exploring how realistic the game is too. You can have the characters eat, jump off the pool diving board, change clothes and so much more.